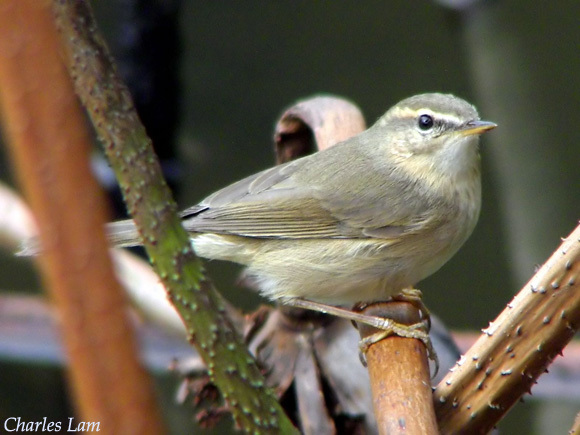 The Dusky Warbler is one of the Old World "leaf warblers". They are found in eastern Asia, ranging from Siberia southward into China in summer, and overwintering in southeastern Asia. Like several of the leaf warbler species, they are occasionally prone to wander far from their normal range. Vagrants occur with relative frequency as far as western Europe, with instances of individuals even overwintering in Great Britain. In North America, they are primarily known from multiple sightings on the islands and coastline of Alaska. However, in 1980, a Dusky Warbler was found on Farallon Island off the coast of California. Since then, multiple other sightings have also occurred in California. Habitat: Found in taiga and boreal areas during the summer breeding season, where they may be found in bogs, wet meadows, shrubby thickets, and open boreal and taiga forest lands. Diet: Feeds on insects and spiders, but they will also sometimes take fruits and berries. Behavior: Actively forages by hopping and flitting in vegetation, primarily relatively close to the ground. They may glean insects directly from vegetation, or capture insects while in flight. Nesting: The nest of a Dusky Warbler is a dome of grasses, moss, leaves, and other vegetative material, with an entrance built on the side. It is placed on the ground, typically in a somewhat protected location such as up against the base of a clump of grasses or other vegetation. The female lays 5 to 7 eggs, and she alone incubates them. The eggs hatch after about 12 days, with both parents helping to feed and raise the young. The young fledge about 2 weeks after hatching. Song: The song is an unvarying whistle that ends with a more rapid trilling. Migration: Strongly migratory, with breeding populations in eastern Asia moving to southeastern Asia (as far west as eastern India) for the winter. As noted above, they are prone to occasional wandering in migration. Similar Species: In their Old World range, may be confused with other leaf warbler species. The Dusky Warbler is more plain in appearance overall, lacking the yellow tones or greenish upperparts of several other leaf warbler species. 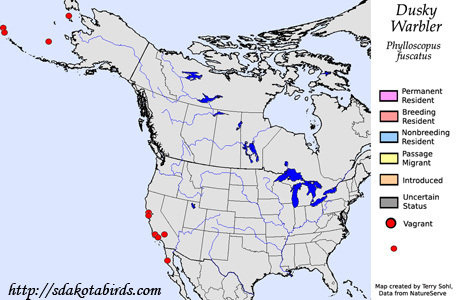 For vagrants found in North America, they are most likely to be confused with the Arctic Warbler. Conservation Status: Populations of Dusky Warblers are found across a broad geographic area, they are common in many parts of their range, and populations overall are considered stable. The IUCN lists the Dusky Warbler as a species of "Least Concern".